The stockings are hung. The presents are wrapped. Letters to Santa have been written and sent. And now my children are happily watching Christmas movies, doing Christmas crafts and later will help me make some mince pies. Without you reading The Boy's Behaviour, commenting, and sharing, I wouldn't have the support, friends, and sanity that I now have. I am comforted by your comments at times when comfort is hard to find, and although I wouldn't wish some of these challenges on anyone - I feel supported by knowing I'm not alone, and I'm able to tell my son that he's not the only one who is struggling, there are many children out there who feel similar, and many adult adoptees too. It means a lot to have so many people reading - this year I reached 100,000 page views, which I think is pretty good for a blog that's not even 2 yet, on a subject that is quite specific and doesn't necessarily appeal to the masses! 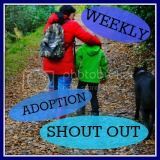 So please do keep reading and sharing - let other people know that adoption isn't as straightforward as it sounds, love is not all you need, and not all children do 'that'.